When I was in college, I HAD TO have music. Whether I was studying, taking random road trips, exercising, working at my student job, or just laying around like a bum in my dorm room, music made a soundtrack for my college days. But back in the dark ages when I was in college, we didn't have ipods- only old-fashioned CD players and downloading programs like Napster (which was later deemed illegal). Oh well. Regardless, now I love iTunes and spend an ungodly amount with them to give me inspirational music for my life's soundtrack and to download the "necessary" apps on my iphone, like Angry Birds and Bejeweled. For every friend that uses me for their senior pictures, I will send you a $10.00 iTunes gift card. 1. There is NO LIMIT to the amount of gift cards you can win. 2. Your senior friend must list your name on the "How did you find Tara Marie Photography" line on their signed contract. 3. This deal will end November 10th. 4. iTunes will come to you right after the friend's photo session. Sorry, but I can't send you cash or any other replacement prize. Use your free iTunes to make a new soundtrack for your college life, or to download "necessary" apps to use during those interesting lectures about theories, history, and all other totally interesting freshman level college subjects. And be thankful you don't have to worry about your CDs skipping. And just to reward my blog readers and facebook followers, I'll choose 2 of you randomly to receive one each on Friday. 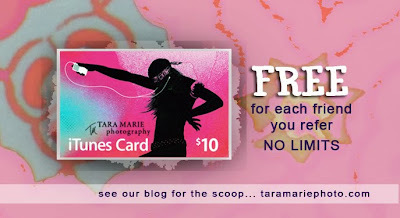 Just leave a comment on the Tara Marie Photography facebook page or on the blog to enter.